Title: Hare Shrine. 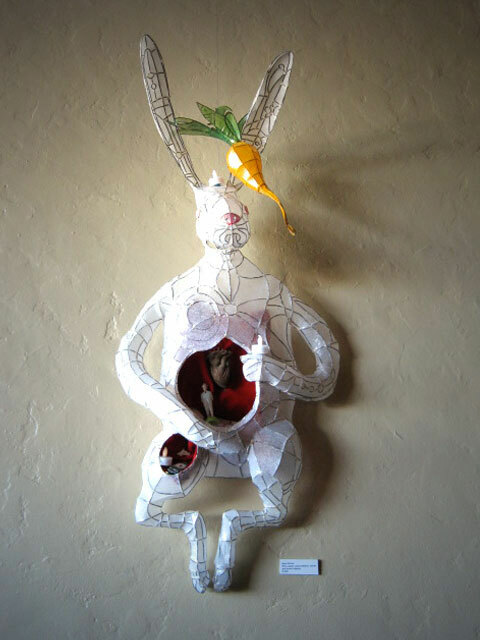 Medium: Brazed Steel wire, Paper, Found Objects, Polyurethane, Red Velvet Date: 01/12/2011 Dimensions: 51” X 22” X 8.5” Description: The Hare Shrine was built in response to the shootings of January eighth that wounded Representative Gabrielle Giffords and killed and wounded many others here in Tucson. The hare and carrot were a recurring theme in my work at the time. It was first shown at the Hotel Congress on January 24th 2011. People in the community were invited to come and place a small object in the belly of the hare which would become a permanent addition to the shrine. I'm very interested in making art that people interact with and contribute to. I find that most people yearn for inclusion and a sense of community and given the opportunity to participate they will suprise you with their creativity and resourcefulness.